John Kasich signed Ohio's medical marijuana bill into law yesterday, making it the 25th state (26 counting Washington, D.C.) to allow some form of medical marijuana use. Ohio's measure is more restrictive than medical marijuana bills in many other states. It does not allow patients to smoke marijuana -- they must ingest it orally via edible products, or use a vaporizer. It doesn't allow patients to grow their own marijuana, and only a handful of conditions, including epilepsy, chronic pain and cancer, qualify for a medical marijuana recommendation. Medical marijuana advocates had launched a campaign to put a broader medical marijuana bill before voters this fall. But the bill approved by legislature and signed by Gov. Kasich was in many tended to stave off more permissive ballot measures. And it appears to have been successful: the group pushing for the ballot initiative recently suspended that campaign, calling the legislature's bill "imperfect" but saying the bill's passage represented "a joyous day for the thousands of Ohioans who will finally be able to safely access much-needed medicine. This year has been a symbolically significant year for medical marijuana policy: with the passage of legislation in Pennsylvania and Ohio nearly 175 million Americans -- over half of the population -- now have access to medical marijuana. These changes are putting pressure on the federal government to update a decades-old marijuana policy that most experts agree is out of step with current scientific understanding of the drug and its risks and benefits. The Drug Enforcement Administration has, since the 1970s, classified marijuana under the most highly restrictive category of regulation: Schedule 1, meaning it has "no currently accepted medical use in the United States, a lack of accepted safety for use under medical supervision, and a high potential for abuse." Marijuana shares this designation with heroin. But drug science has come a long way since the 1970s. Researchers now know that marijuana is actually one of the least-addictive mind-altering drugs. Even chronic uses poses few serious risks to physical health. Most importantly, at least for federal classification purposes, marijuana has been shown to have great promise when it comes to medical use. It's been shown to be an effective treatment for chronic pain. 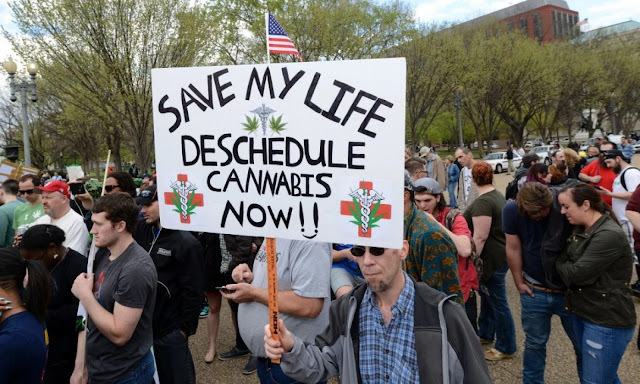 Given that people with this condition are routinely prescribed powerful painkillers that cause tens of thousands of overdose deaths each year, broader use of medical marijuana in these cases would quite literally save lives. But neither the research, nor more widespread public acceptance, have so far prompted drug authorities to relax federal restrictions on marijuana. The biggest marijuana-related change at the DEA in the past year was an acknowledgement by the administration's chief that heroin is in fact more dangerous than marijuana. The DEA Administrator still believes that medical marijuana is "a joke." The DEA is currently in the final stages of reviewing a petition to re-schedule marijuana and has told lawmakers it will have a final decision by July. Advocates of medical marijuana reforms say the petition represents a chance to bring the agency more in line with public opinion, scientific consensus, and the lived experience of millions of medical marijuana patients.